I’ve read 3 of Joana Starnes previous books and loved them all, so the expectations for The Unthinkable Triangle were very high, and so was the excitement. I was counting the days for it to be released and was not disappointed when a few days later I finished reading it. I started reading the book on a Saturday morning, and despite being with my family near the beach (2 big distractions for me) I could not let it go. Even my husband, who is now very familiar with my dedication to books, and my constant sights while reading JAFF, was a bit jealous of all the time I was spending with Mr. Darcy this time. But how could I resist such a perfectly designed character? Joana Starnes made this Darcy honourable, loyal, intense, passionate, romantic, just…PERFECT. Truth is, I couldn’t do anything else the entire weekend apart from reading this book. 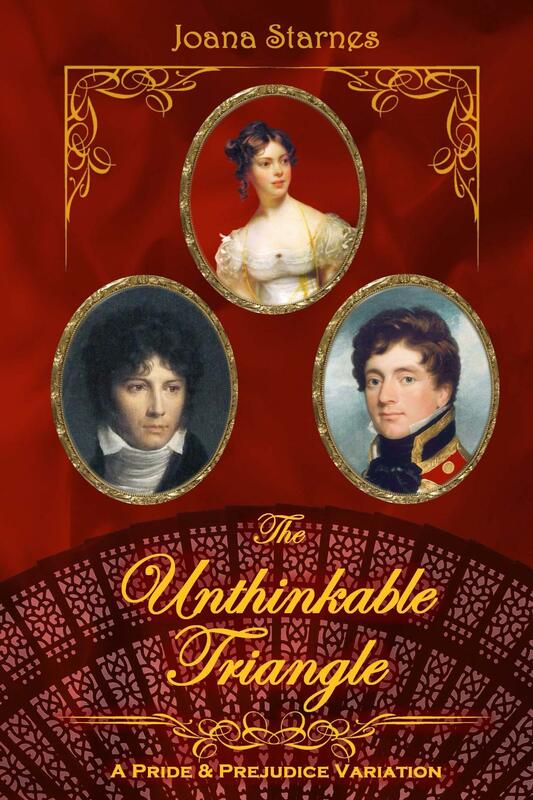 The Unthinkable Triangle has a very similar premise to Victoria Kincaid’s Pride and Proposals (which I loved!) but it develops in a very different way. I was afraid the books might be similar, but they are as different from one another as they are passionate and intense. This book starts in one of my favourite scenes from Pride and Prejudice, during Darcy and Elizabeth’s conversation while she plays the piano at Rosings. It continues with Darcy’s decision to propose to Elizabeth, only to discover that Richard had proposed and was accepted, the day before his own proposal would take place. Can you imagine what Darcy must have felt? Can you imagine how his life would be if the only woman he could ever love would be married to his dearest cousin and best friend? If you cannot imagine what Darcy’s heart must have suffered at this discovery, you have to read this book, because from that moment on, we will read Darcy’s torturous path from his own perspective, and even though I do enjoy torturing proud Darcy, I just wanted to read more and more to see when it would be over! The book is so intense that Darcy’s angst and pain becomes our own, we can feel it deep in our hearts and it is almost unbearable until it reaches a point we just wish our dear Mr. Darcy won’t do something he will terribly regret! This was something that really amazed me while reading the book. Joana Starnes was able to transmit such intense feelings that Darcy’s despair was my own at a certain point. I have read many JAFF authors, and obviously some of them stand out. I have recently come to understand that the ones that do stand out for me, have a specific characteristic that I associate with them. Some are incredibly good at creating different scenarios, some have an exquisite writing, some never get it wrong no matter how many books they write, and some have this unexplainable ability to make us feel everything the characters feel, to make us feel we are actually in the book. Joana Starnes is this type author, apart from all the other characteristics that she also possesses, her writing transports us directly into the book and into the characters soul! More than the plot what captivates me in a book, what makes me love or hate it, is what it makes me feel. When a book doesn’t make me feel anything, even if the story is interesting, I will hardly remember or like it. And Joana Starnes makes me feel everything Darcy and Elizabeth felt. The Unthinkable Triangle is full of feeling, and for that it, it is a book full of soul. I am only sorry I do not possess Joana Starnes talent with words to describe how exquisite and wonderfully written this new book is. To describe how engaged we become when reading The Unthinkable Triangle and how sorry we are when it is over, and we can no longer be with this perfect Mr.Darcy who defends Elizabeth’s honour in a most passionate way, who cares for her when there is no hope to ever be the one with that responsibility and who pledges to be no one else’s but hers. Joana Starnes appears to be one of those authors who cannot get it wrong, and this book is yet another proof of it. I highly recommend it to anyone who cannot get enough of Darcy and Elizabeth. Thank you for another lovely review, you show such passion for the subject that I really enjoyed it. But now I have an issue… I want to read this book! 😁 I am totally in the queue for the giveaway! Thank you so much for your kind words Diana! It is people like you who keep me motivated 🙂 Best of luck for the giveaway, and regardless of the result I hope you do read and enjoy the book. Rita, you say you don’t have Joana’s way with words, but I disagree. Your review of her latest book is most eloquent about the way it makes you feel, far more eloquent than I could ever be. I haven’t read it yet myself as I’ve still got my fingers crossed for a giveaway win somewhere. I will be getting it eventually, though, should Lady Luck not come my way. Thanks so much for the earlier giveaway and this review. From what you said in your review, it looks as though we can count you in as a card bearing member of the “Let’s Torture Darcy” club! I wholeheartedly agree, Anji, we need to get those membership cards in the post 😉 Best of luck in the giveaway, hope Lady Luck smiles kindly, and that you’ll like the whole story when you get to read it. Thanks a million for all your support and yours too Rita, MUCH appreciated! Best of luck to the giveaway Anji and thanks once again for your kind comment. Rita, please take my name out of the giveaway hat as I’ve just hear I’ve won a copy on another blog. I’m with you in what you say about torturing Elizabeth, too. She’s just as much to blame in many circumstances as Darcy! Every review I read makes me want to read this book more and more. I would love to win a copy! Thanks so much for the kind words, Maureen! Did you have a look at Tamara’s post? I think you might be the lucky winner of the giveaway at ‘My kids led me back to P&P’, but I’m not 100% sure. Do check and if so, please let Tamara or me know your email address so that I can send you an e-copy. If not, best of luck in this giveaway and thanks for following the blog tour. I love when an author is able to write in such a way that pulls us into the story and we experience the thoughts and feelings of the characters. It’s such a powerful and emotional charged way to engrossed in a novel. Joana you hinted that their maybe a sequel to this novel in order to give Col Fitzwilliam his own HEA… Anymore news on that front? Although I love Darcy and Elizabeth to have their HEA, I just can’t bear to thing that it’s at the expense of Col Fitzwilliam…. Thank you, Dung Vu, for the wonderful words! I’m ever so moved to hear that the excerpts had this effect on you. I hope you’ll like the full story when you get to read it. As for the sequel, it’s still at the very early stages, but hopefully it’ll be finished one day. Thanks again for your interest and I hope you’ll be pleased with the Colonel’s HEA too. It’s already mentioned in this story, but since this one is from Darcy and Elizabeth’s POV, they have a limited knowledge as to what the dear Colonel is actually thinking. The sequel would say more, but since I wasn’t anticipating writing it when I wrote The Unthinkable Triangle and the thought of it sprung from the comments of some readers, TUT is a stand-alone story so fear not, I won’t leave anyone in limbo. Best of luck in the giveaway and thanks for your support! What a great review. You are right about Joana’s writing style. She really captures the deep love that Darcy has for Elizabeth. From being wary of reading a book with Elizabeth engaged to someone else I now can’t wait to read it. Thanks for the giveaway. Just wanted to add a BIG thank you, Rita, for your warm welcome and this absolutely wonderful review. I’m ever so happy that you liked the story and that you found it to be a book full of soul. Your ever so kind words are much, much appreciated. It was such an honour and a pleasure to be your guest! Thank you Joana! The honour and pleasure were all mine! I only hope the review might do justice to the quality of work you presented us in this book. I’ve read it twice already, it is so good. Love Joana’s books. Thanks so much for the kind words, Lynn! I’m so happy that you liked it! Rita, your review just had me transported to Rosings and to the new and mind blowing Joana Starnes perspective of Mr. Darcy! I was just hoping I had the book already cause I’m dying to read the whole story. Congratulations for your amazing review and for introducing me to the author Joana Staines. I’m totally in for the giveaway! Best wishes and I hope to read from both of you very soon. Thanks for the lovely comment, Rita Santos. So glad to hear that Rita’s amazing review made you want to read the rest of the story. I hope you’ll like it. Good luck in the giveaway and thanks for taking part! The story sounds really good. Although I normally dislike triangle stories with Col Fitzwilliam, this is one I think I might enjoy anyway even with the angst. Isn’t this truly the unthinkable triangle? I am a huge Col Fitzwilliam fan.